1. First look or No First Look? I know we’ve heard it time and time again. Seeing the Bride before the wedding can be bad luck or you want your grooms initial reaction to be when he sees you coming down the aisle for the first time. It’s NOT bad luck to see one another before the ceremony, that’s actually an old tradition from pre-planned marriages. People didn’t want the groom to run from the bride before the ceremony. A first look can actually give you time to just enjoy one another before all of the festivities begin, most couples don’t really get a chance to enjoy one another’s company when the ceremony is done. Doing a first look will also give you chance to maximize your portrait time. You can photograph your bridal party before, capture your family portraits before, or do portraits of you two alone. That way after the ceremony is done you’re not rushing to fit everything into one hour of time before your reception. 2. Book the hotel’s biggest suite if possible. A photographer’s job is to capture and document your story. 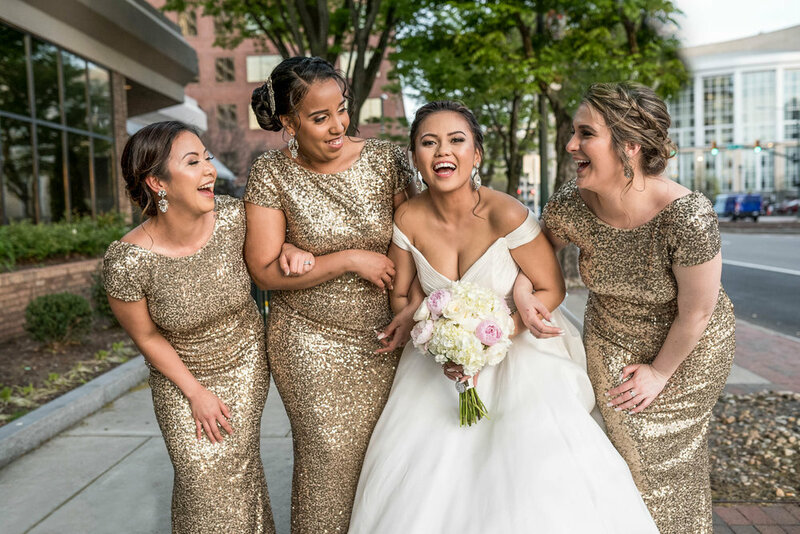 Normally the hotel’s larger suites can house more of your bridal party comfortably and it typically has some nice photo ops. It can be harder to photograph your dress when a room is full of bags and 10 bridesmaids. Your wedding day will fly by and you should enjoy every minute of it. Don’t stress the small stuff. Take it all in and embrace your day. Have moments with your loved ones. Smile and realize you’re marrying the person you love most. Let the team you hire handle the small details. This can save you a lot of headaches going forward. Having a planner and professional there to fix the little things can make your life so much easier. Let your family and friends enjoy the day with you.